A friend asked if I'd make a messy bun hat for his wife's birthday. I found this pattern on Ravelry, Ribbed for Her Pleasure Messy Bun Hat by Nataly Navarro. 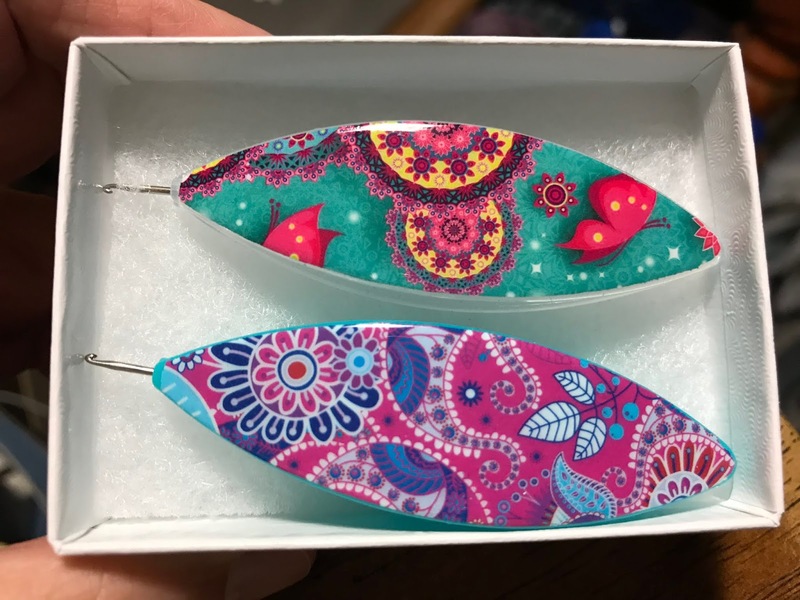 I started four other patterns that just didn't catch my interest. This one worked out quickly and easily, and it had something really different that I really liked. The first round is crocheted over a hair tie. 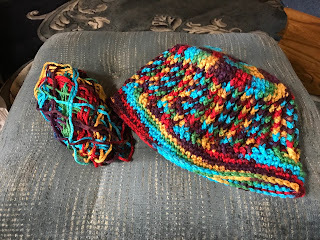 I'm not sure if having the hair tie in there will wear the yarn out more quickly, but it does make a nice, neat start to the hat. I'm just about finished with the second ball of Mandala yarn for Lily's afghan. This Virus Blanket really works up quickly. I think one more ball of yarn will do it. There are other tutorials for this blanket, but I really like Fiber Spider's instructions. Yes, my shuttle addiction continues! 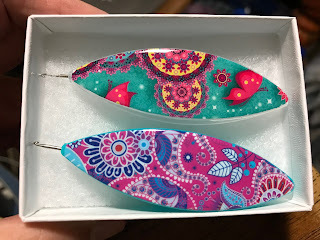 These are my two newest ones from Rita Richmond of Shuttle by Design. Recently, there was quite a bit of discussion about the direction the hook faces. I'm right handed, and I prefer to have the hook facing to the right, away from me. If you look closely, you can see that the bottom shuttle has the hook facing right, and the top shuttle has the hook facing left. This is not a problem for me. I just turn the shuttle over and tat away! 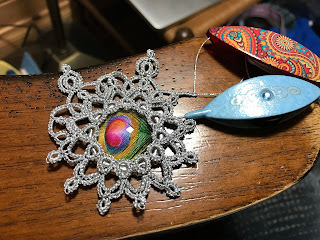 No, I haven't given up tatting. I'm just really focused on finishing these afghans for Christmas. I'm working on a snowflake design. I'm not sure I like the way this is turning out, but I will finish it as is and then determine whether or not it's worthy of a repeat tat! Thanks, Sue! I already have a taker for the snowflake. Beauty is in the eye of the beholder! Splendid hat, looks like cross stitch. You’re making great strides on the afghan, I can’t imagine how you find a moment to tat. 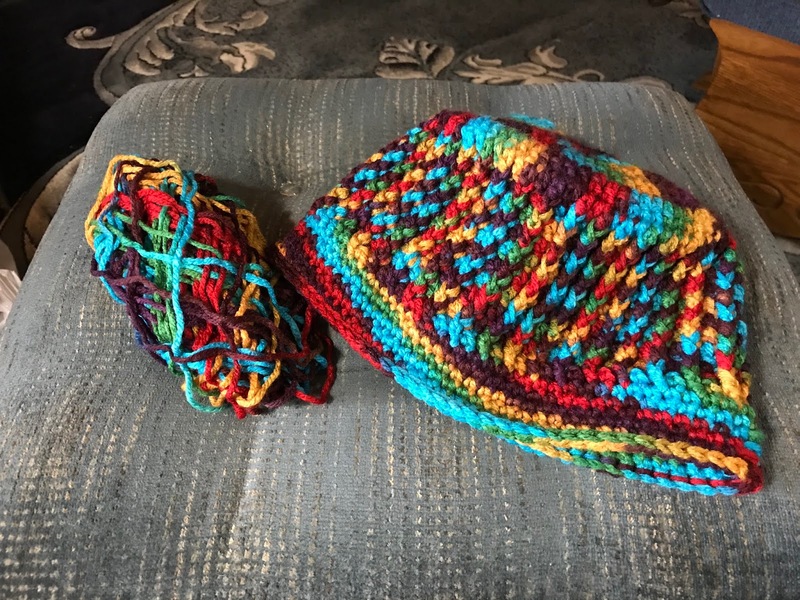 The hat uses front post double crochet. I really like the look! I do try and sneak in a ring or chain here and there! LOVE the hat and the afghan. 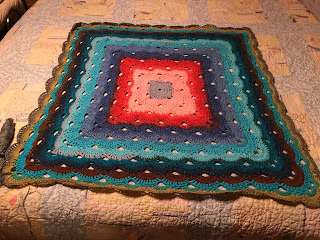 In fact I'm thinking of starting an afghan like that too!!! You're leading me astray again!!! I made a hat with a hair tie last year, the yarn hasn't been damaged by it at all. Funny, I didn't use a pattern because I didn't know there was one featuring that idea! I guess the saying is right: great minds... :) I've tried your link to find this particular pattern but it goes to Ruth Mary's website. Here's the link to Ravelry: https://www.ravelry.com/patterns/library/ribbed-for-her-pleasure-messy-bun-hat. Thank you! I've corrected the link. I never would have noticed, otherwise. Wow you make me sorry I did not stop by in a while! everything is so very beautiful and fantastic colors too!